Did the author of a now-retracted article bribe a critic to silence him? Authors react in a variety of ways to criticism of their work. Some stonewall, some grit their teeth but make corrections, and others thank their critics. But what about bribery? After an economist alerted a journal and government agency to potential problems with a 2015 paper, he says the first author tried to bribe him to withdraw his accusations. Jen-Chang Liu, a professor at Takming University of Science and Technology, raised concerns of misconduct in the paper, “The financial crisis research: a bibliometric analysis,” in a letter to the editors back in May. While the journal was investigating the allegations, Liu claims he was bribed by first author Chien-Lung Hsu, also a professor at Takming, to the tune of 30,000 Taiwan dollars (equivalent to $1,000 USD) to withdraw his accusations of plagiarism from the Taiwanese Ministry of Education. The paper’s two authors, Hsu and Chun-Hao Chiang at Mega Financial Holding Company, vehemently deny giving Liu any money. Hsu told us that they “regret” the retraction and “are still trying to mend the insufficiency and improve the article.” The paper has been cited three times since it was published in 2015, according to Clarivate Analytics’ Web of Science. The Editor-in-Chief has decided to retract the following article, Chien-Lung Hsu and Chun-Hao Chiang: The financial crisis research: a bibliometric analysis. Scientometrics 105, pp. 161–177, DOI 10.1007/s11192-015-1698-z. Upon investigation carried out according to the Committee on Publication Ethics guidelines, it has been found that the article contains severe insufficiencies regarding the use of sources and replication of material (figures, tables and verbatim text) without attribution or with inappropriate quotation. The list of identified cases comprises the following sources. Further inconsistencies concern retrieval, management, and reporting of data resulting in irreplicability of figures and findings. The authors have agreed on the retraction. We regret to see this result of retracting our article. We are still trying to mend the insufficiency and improve the article. Hope we can resubmit the manuscript which can satisfy the standard of the Journal. About the accusation of Mr. Liu is not true. My coauthor and I have conducted bibliometric analyses for many years and we spent lots of time and effort on this manuscript. It’s really difficult to publish on an international top journal. The retraction is a great blow to us. But it reminds us to have more prudent attitude when conducting research in the future. Hope we can have more valuable contribution to the academic. Liu, who has previously accused other Taiwanese scholars of fabricated papers, openly criticized the Scientometrics paper in multiple online posts in November 2016. Liu said he subsequently submitted his concerns to both Takming University and the Taiwanese Ministry of Education, and in May 2017, submitted a Letter to the Editor at Scientometrics, expressing his concerns of plagiarism. An investigation was initiated and performed by a Special Editorial Committee, in which all documents provided by Dr. Liu and Drs Hsu and Chiang were taken into consideration. Both parties seemed to understand and acknowledge the report and its conclusions. 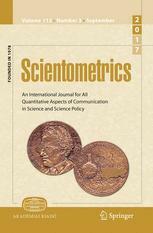 Based on the suggestion of the report, the Editor-in-Chief of the journal Scientometrics, Prof. Wolfgang Glänzel, initiated the retraction of the paper. He insisted me to take it. I took it so as to alleviate his hostility toward me, since I am confident that it will be retracted. I distributed them to my students. At the same time, close colleagues of me said that it could be described as bribery or extortion. Under pressure and bribery, on 20 June Mr. Hsu and his secretary asked me to sign a Chinese document (no legal effect) containing 5 declarations. I refused to sign it unless it deleted the one claiming Hsu did not violate academic ethics. Liu did sign the document. Here is the original version, revised version, and English translation. [W]e did not give Dr. Liu anything as a gift. We have no idea why he made the claim and we can’t see how he described the money exchanged only by the pictures. But how can we explain if we did not do it? Hope you can understand that the only thing we want to do now is to revised the article not to fight with others. Since we have known the criticisms of article was made by Dr. Liu whom is the colleague with me at the Takming University. We tried to discuss the article with him to clarify his queries and finally we got his understand and kindly provided us the statement. We have no idea about the difference between the original and revised versions because as the pictures, both of the documents have his signature on them. 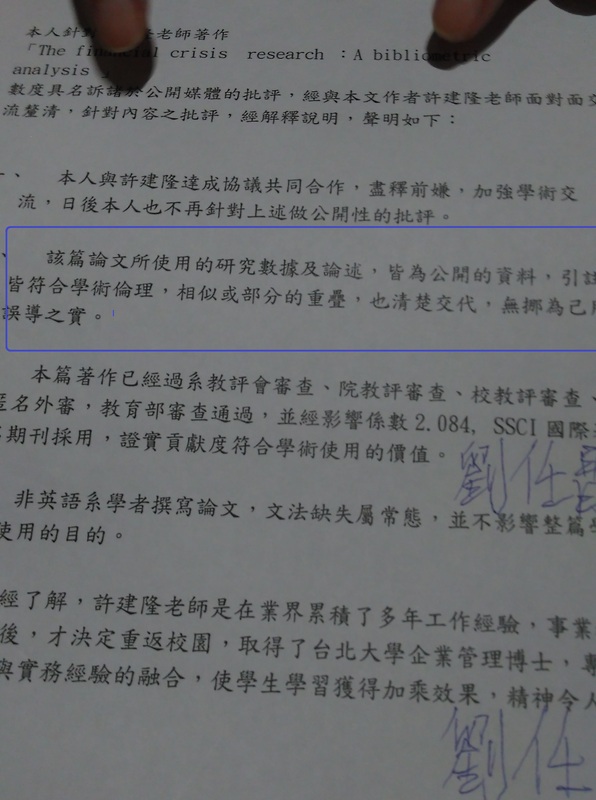 And I don’t know why we have to deny a document which asserts the misunderstandings of the article with the signature of Dr. Liu? No one can push Dr. Liu to sign any documents without his agreement. wanted to end the meeting and I was confident that Hsu’s paper would be retracted. And it was, a fact that may be one of the only clear agreements in this story.